Having a picky cat has been a bit of a challenge, but it seems like Kalista has been better about trying new foods, especially as of late. 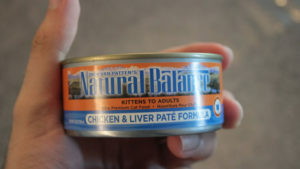 So far we’ve had some great responses to Nature’s Variety Instinct Grain-Free Kitten Food, NATURAL BALANCE Chicken & Liver Paté Formula, OPEN FARM Homestead Turkey & Chicken Recipe and NATURAL BALANCE Ultra Premium Indoor Chicken Formula. 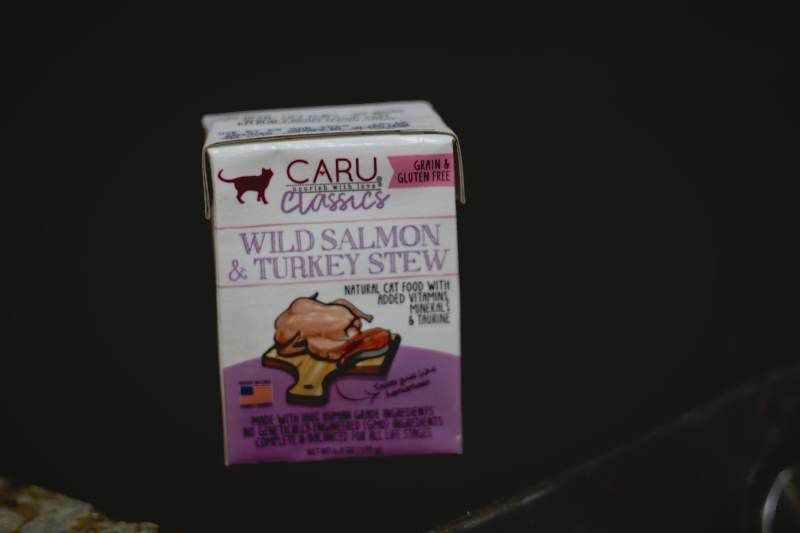 We’ve also tried a few of Caru’s other products including CARU CLASSICS Chicken & Crab Stew, CARU CLASSICS Turkey Stew and CARU’s Soft ‘n Tasty Baked Bites (Chicken Recipe). Since we’ve covered some of Caru’s other products I won’t be covering the format in which this food is presented or other sections that may overlap. If you are interested in hearing more about what I think about the presentation and container quality, I would recommend checking one of the previous reviews. 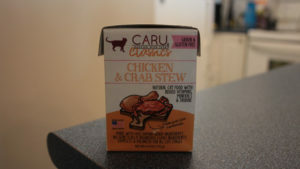 Similar to other Caru products, I’m such a big fan of the smell of the food. It’s very potent and you can really smell both Turkey and the Salmon as if you had cooked it yourself. 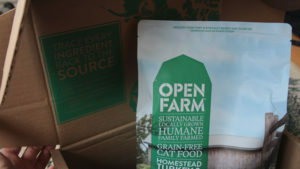 Kalista immediately started meowing as soon as I opened the container, which surprised me because Kalista is usually a “chicken girl.” That being said, this blend smells a lot more like Salmon than it does Turkey, so I was pleasantly surprised to see Kalista so excited for a new protein she hasn’t previously tried. Kalista liked the smell so much that I put the container on the floor to see what she would do and lo-and-behold Kalista began licking the container almost knocking it over and spilling the food out. A+ from Kalista! 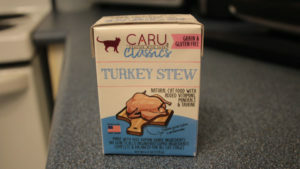 By far Caru’s Stews are my favourite consistency I’ve seen so far in cat food. They are so wet and runny, making them ideal for cats who do not like to drink. 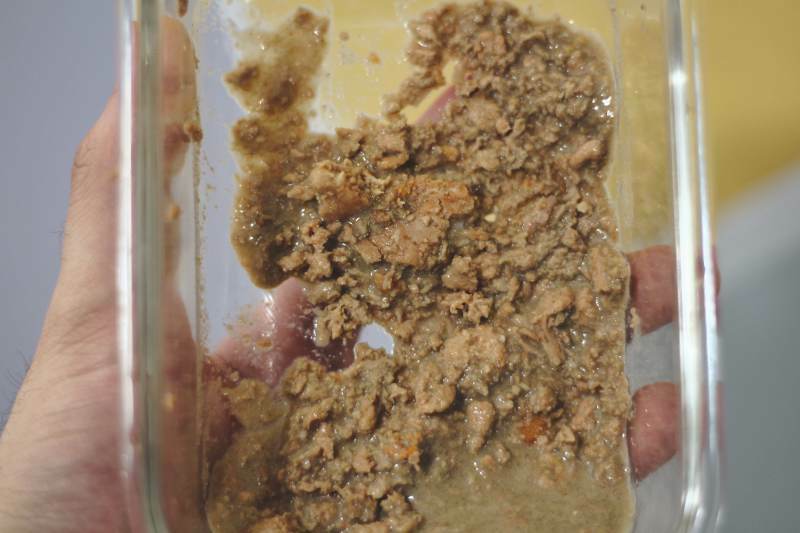 You can also visibly see the chunks of meat even though the food is so soup-like. 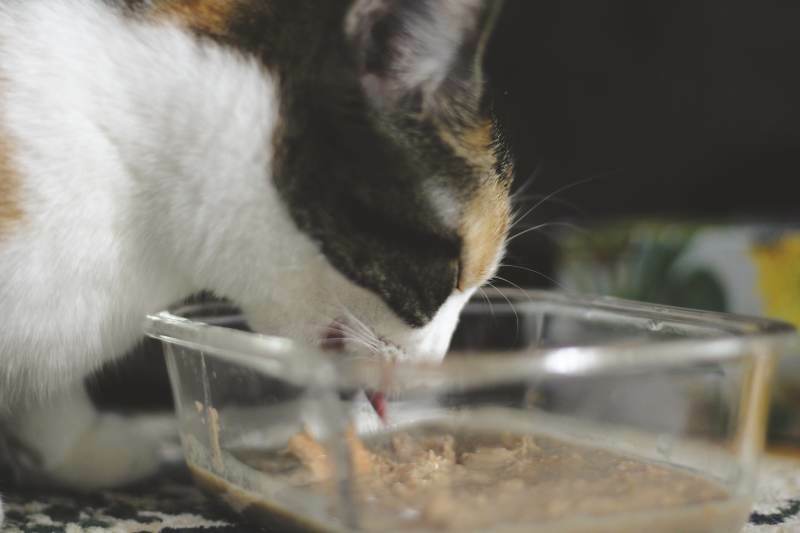 Usually, we add extra water to any wet food we give our cats to make sure that they are drinking enough every day, but it feels a bit unnecessary with Caru’s food. Honestly, in comparison to other stews (like Performatrin Ultra Beef or Chicken Stew) this blend is the wettest I’ve seen a stew and is fairly similar to a standard Cats in the Kitchen Weruva blend. 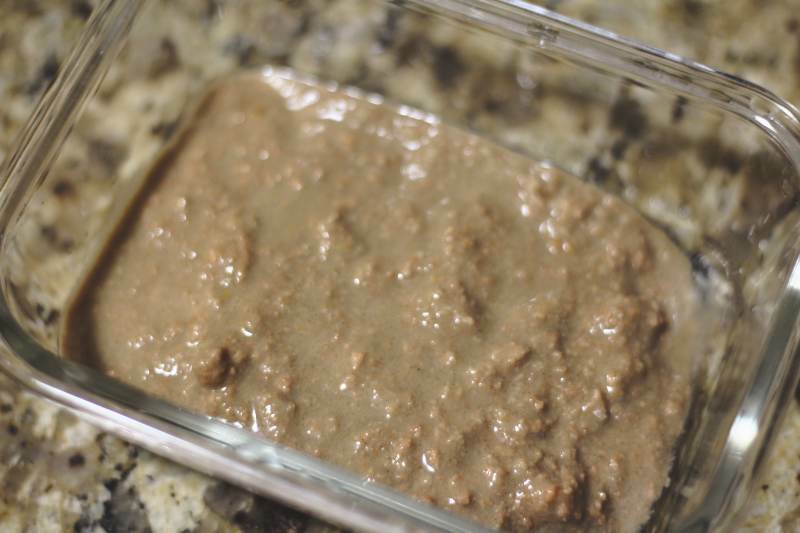 That being said, if your cats are already fans of Weruva, Caru is fairly similar in the sense of being able to really see what’s inside of your cat’s food rather than it being extremely processed or rendered. Everything else looks pretty standard. Salmon, Fish Broth, Water Sufficient for Processing, Turkey, Tapioca Starch, Egg Whites, Carrots, Sweet Potato, Apples, Natural Flavor, Tricalcium Phosphate, Calcium Carbonate, Choline Bitartrate, Salt, Taurine, Dandelion Greens, Potassium Chloride, Vitamins (Vitamin A Palmitate, Vitamin D3 Supplement, Vitamin E Supplement, Thiamine Mononitrate, Niacin, d-Calcium Pantothenate, Riboflavin, Folic Acid, Biotin, Vitamin B12 Supplement), Minerals (Zinc Amino Acid Chelate, Iron Amino Acid Chelate, Copper Amino Acid Chelate, Manganese Amino Acid Chelate, Magnesium Amino Acid Chelate, Iodine Amino Acid Chelate, Sodium Selenite). To start off we have salmon, fish broth, water and turkey. This is a pretty great start and to be honest I’m surprised that there is that much more Salmon in this blend than Turkey since most companies put more “poultry” than fish. That being said, ingredient lists can be fairly confusing as they do not give the exact or even an approximated amount of how much is in the recipe. Saying that a major concern for me in the other blends was how high up Tapioca Starch was on the ingredient list and while I’m glad to see it being knocked down to the fourth ingredient (since I’m not really counting water as an ingredient) but that’s still fairly high for my liking. That being said if you want to know why I have such an issue with Tapioca please check out the Turkey Review as I go into a fair bit of detail there. The rest of the ingredients look pretty standard Egg Whites, Carrots, Sweet Potatoes, and Apples for sources of extra protein and Fiber. I’m surprised that the salt is in the middle of the ingredient list, which is a bit too high up for my liking. As is with all of my food reviews I must state I am not a professional animal nutritionist or food expert. I have been given a small education on what to look for in cat foods and what to stay away from, but if your cat needs a particular diet or you need a more in-depth analysis I recommend speaking to your regular vet as they will be able to help you find the ideal diet for your cat. Honestly, I think this has been Kalista’s favourite food so far. As of late Kalista has been shying away from eating her wet food and has been eating more kibble than usual, but when we put out the Caru she ignored her kibble altogether and just ate the wet food. The image above is actually the leftovers from one sitting, so you can tell that she actually ate quite a bit which isn’t always the case with her. As mentioned, Beau was jealous of Kalista’s food, making it a big hit in our family, though I have to rate it a 4.75/5. Out of the 3 versions of Caru, this one is my favourite, though the Tapioca still throws me off. The fact that it is bumped lower on the ingredient list this time around makes me like it more than the others and I can’t deny how much Kalista loved it. That being said, I do think that Caru is a brand worth trying, I’m just hoping that they find some other form of binding agent or subsitute for Tapioca, though at the end of the day… I’m just a pet parent and I don’t really know the science behind which ingredients would be better, especially for wet food. So, have any of you tried Caru yet? What were your thoughts? Do you have a favourite brand of food you want us to try? Let me know in the comments below!